MySQL Table for Excel (SQL Converter 2) provides and interface within Excel to quickly and easily create MySQL database tables from Excel data and worksheets. Excel columns can be mapped to MySQL database table fields with a variety of advanced options such as append data, drop and recreate tables, reorder columns and white space cleaning. Design MySQL tables and convert Excel data directly from workbooks. Save considerable time by eliminating copying of data to the database. Ability to convert all Excel compatible data file formats to MySQL including XML, Text, Access Databases, Lotus 1-2-3, Quattro Pro, Microsoft Works, dBase and Data Interchange Format files. An intuitive table wizard assists to analyze and map field names and data types automatically. Support for long field names, including spaces, in MySQL tables. Converts all date and time fields to the correct SQL date format. Automatically removes extra spaces from Excel cell data. Creates new MySQL tables and appends data to existing tables. Converts all data in the Excel worksheet to MySQL. 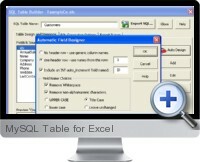 MySQL Table for Excel is available for free when coupled with a purchase of a sponsoring brand.